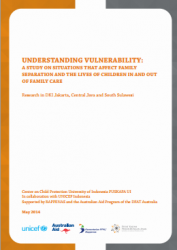 PUSKAPA, the Center on Child Protection at the University of Indonesia, conducted this assessment to understand situations that lead children in Indonesia to be outside of family care—living either in childcare institutions or in non-institutional arrangements—and to assess the living situations of these children as well as those facing vulnerabilities within family care. This report unpacks key challenges faced by families that push them to send their children to institutions, pull factors being offered by institutions to attract children, and the well intentioned but often insufficient social assistance available for vulnerable families. It was conducted in collaboration with UNICEF Indonesia and supported by BAPPENAS (the Ministry of National Development Planning) and the Australian Government Aid Program of the Department of Foreign Affairs and Trade (DFAT).